Local and Proud! Photography by James B. Gumley. The Chamber expresses our sincere thanks to everyone who helped us celebrate our 60th Birthday on Friday, August 18th! We enjoyed a ribbon and cake cutting, and 60 lucky guests left with our limited edition “Local and Proud” Chamber bags. Three guests also received $60 CASH in their bags, and Scott Holmer and Jeanne Walker were the proud winners of our door prizes! 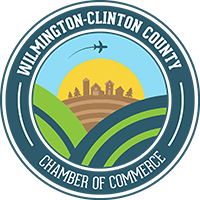 We look forward to continuing our strong legacy in Clinton County and serving our business community for decades to come! Chamber Board President, Cheryl Webb, addresses our guests.